From self-care books to a stunning interiors range, here are team Irish Country Magazine's weekly favourites. Here at Irish Country Magazine HQ, we love chatting about our favourite things and to be honest, we are also just a little bit noisy and love to hear about what other people are doing or using. We thought it would be a good idea to share our favourite things with our readers and then you can in turn let us know the things that you are loving also! This way we can all get some education and inspiration on whole range of topics, from interiors and books to fashion and food. Get to know us and find out below what products and people we are obsessed with this week. Also, this is two way street and we’d love to hear from you. Comment underneath this post on Facebook, Twitter or Instagram and tell us what things you love and would recommend for us to try. This week I am living for Copenhagen Fashion Week – the Fall 2019 shows started this week but it is the street style and influencers I am most excited by. Copenhagen has been put firmly on the fashion map over the last few years, producing exciting brands and really forward thinking bloggers who’s street style looks revival New York Fashion Week. My favourites – and who to follow for some serious outfit inspiration – are Hanna Mw, Hanna Stefansson, Babba C, Thora Valdimars and Jeanette Madsen. I’ve been trialing the new The Full 360 Mascara from No7 at Boots this week, and the results have been great. The thing with finding a mascara you love is that it’s all about personal preference. What I look for from my day-to-day mascara, is volume and curl – my lashes are naturally quite long – and overall I tend to go for quite a natural makeup look. The Full 360 delivers on that, making my lashes look full and separating them well, without clumping. The brush is curved which I assume delivers the slight curl and lift that it gives me and makes my eyes look more open. The other thing that I really like is that it’s easy to build upon – if I’m going to an event after work and want to touch up my makeup without having to take it off, this mascara can layer on top of itself without turning into a balling, clumped mess, and without feeling or looking like my lashes are weighed down with product. It’s available in all Boots stores and online for a special price of €13 until the 12th of February, when it goes up to €18.50. My interior crush at the moment has to be Mid-Century Furniture! I also love scanning second hand stores, trade websites and insta pages for finds and idea’s (even though I don’t have my own home yet!) A very cool new brand to Arnotts is West Elm which brings a contemporary feel to this furniture. Since trying the 'spuds with chorizo' at Storyboard restaurant in Dublin 8, I’ve been obsessed with making the dish at home myself. It sounds so simple and it is but don’t you love a dish that you can make your own and don’t need to follow a recipe for it to taste delicious? I quarter chop a handful of baby potatoes (five or six) and pop them in a pot of boiling water until soft, but not mash texture as they still need to be a little bit firm. Meanwhile in another pan I put in sliced chorizo and any vegetables or salads that I have in the fridge. When the potatoes are soft, add them to the pan and season with herbs, spices and a little olive oil. I also love to make extra and box it up for my lunch the next day and trust me, your future self with thank you because it is super tasty! 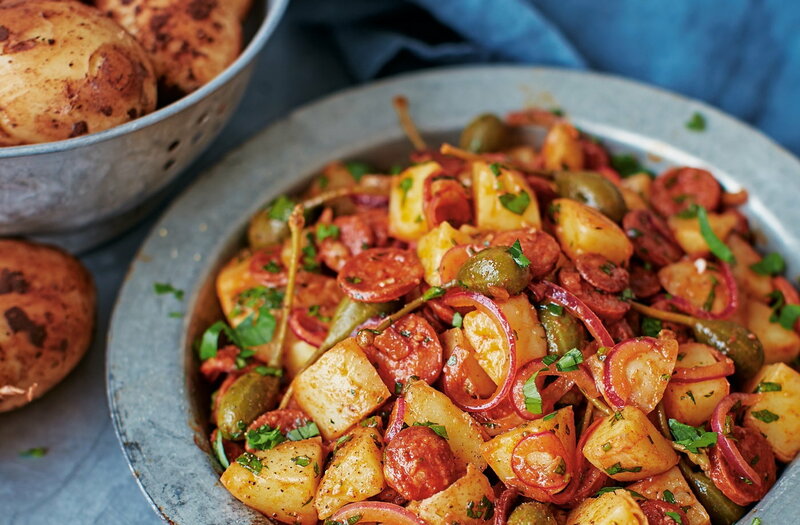 If you like to follow a recipe, try this Tesco Potato salad with chorizo, caperberries and paprika recipe. Self-help books that actually help! Calm The F*** Down by Sarah Knight is brilliant. As someone who tends to overthink every situation, this book is encouraging me to get out of my head and do something to fix things that are bothering me. The Burnout Solution by Siobhán Murray is a real eye-opener into how stress affects our bodies, and also shows how we tend to self-sabotage our own wellbeing. Guilty! It has been really nice to focus on reducing stress in the past few weeks, rather than trying a scary new gym or committing to dry January!